Dr. Najma Heptulla has assumed office as a Minister of Minority Affairs here today. The Secretary briefed the Minister and gave a presentation to her about the activities of the Ministry in presence of other officers of the Ministry. Dr. Najma Heptulla took note of various schemes and said that she will chalk out a roadmap for activities soon. 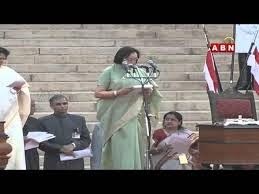 She sought co-operation of the officers of the Ministry in her endevour to serve people better and effectively.